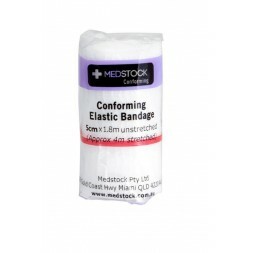 Conforming Elastic Bandage Medstock Conforming is an elastic bandage made from cotton, viscous and polyester. It is ideal for the binding of various body parts, supporting sprains and soft tissue injuries, fixation of wound dressings and the protection of fragile skin. Soft and gentle on skin. Highly stretchable. It provides great elasticity, allowing good blood circulation and movement of joints. It is highly permeable to moisture and air. Conforms well to awkward areas of the body. Lightweight, fray resistant and durable. Non-sterile and latex free.